Carotenoid compounds play essential roles in plants such as protecting the photosynthetic apparatus and in hormone signalling. Coloured carotenoids provide yellow, orange and red colour to plant tissues, as well as offering nutritional benefit to humans and animals. The enzyme phytoene synthase (PSY) catalyses the first committed step of the carotenoid biosynthetic pathway and has been associated with control of pathway flux. We characterised four PSY genes found in the apple genome to further understand their involvement in fruit carotenoid accumulation. The apple PSY gene family, containing six members, was predicted to have three functional members, PSY1, PSY2, and PSY4, based on translation of the predicted gene sequences and/or corresponding cDNAs. However, only PSY1 and PSY2 showed activity in a complementation assay. Protein localisation experiments revealed differential localization of the PSY proteins in chloroplasts; PSY1 and PSY2 localized to the thylakoid membranes, while PSY4 localized to plastoglobuli. Transcript levels in ‘Granny Smith’ and ‘Royal Gala’ apple cultivars showed PSY2 was most highly expressed in fruit and other vegetative tissues. We tested the transient activation of the apple PSY1 and PSY2 promoters and identified potential and differential regulation by AP2/ERF transcription factors, which suggested that the PSY genes are controlled by different transcriptional mechanisms. The first committed carotenoid pathway step in apple is controlled by MdPSY1 and MdPSY2, while MdPSY4 play little or no role in this respect. This has implications for apple breeding programmes where carotenoid enhancement is a target and would allow co-segregation with phenotypes to be tested during the development of new cultivars. Carotenoid compounds have important roles in biochemical processes in plants such as light harvesting during photosynthesis and protecting the photosynthetic apparatus against damage. As secondary metabolites, these compounds accumulate in plant tissues to give attractive colours, which facilitate pollination and seed dispersal. In fruit and other plant tissues, colour is of high consumer and commercial value . Carotenoids have potential health benefits in reducing the risk of diseases [2, 3]. In food crops, carotenogenesis contributes to nutritional quality through accumulation of alpha- and beta-carotene, which are major sources of pro-vitamin A [4–7]. Carotenoids serve as substrates for the biosynthesis of apocarotenoids such as abscisic acid and strigolactone which mediate stress and developmental signalling responses [8, 9]. Phytoene synthase (PSY) plays a pivotal role in the carotenoid pathway as the first committed step and acts to control flux through the pathway [10, 11]. The number of PSY genes differs between species, a result of duplication events, which have significance for function and modulation of carotenogenesis. Arabidopsis has a single PSY gene while two PSY genes have been reported for carrot [12, 13]. Tomato, cassava and members of the grass family, such as maize, rice and sorghum have three paralogs [14–17]. Since PSY plays such an important role in the carotenoid biosynthetic pathway, the implication of this gene duplication is not insignificant and may be related to producing carotenoids for diverse roles as suggested earlier [18, 19]. The presence of multiple PSYs in plants has resulted in distinct roles acquired by individual members . In maize, ZmPSY1 is important for carotenoid accumulation in endosperm as well as stress-induced carotenogenesis in green tissues. ZmPSY2, which is upregulated by light, is associated with photosynthesis . ZmPSY3 is stress-induced and specifically expressed in roots . Similarly in rice, the multiple PSYs have distinct as well as overlapping roles. Rice OsPSY1 and OsPSY2 are involved in carotenoid biosynthesis under phytochrome control in green tissues, and as found in maize, OsPSY3 was also up-regulated during stress treatments . In tomato, virus-induced gene silencing (VIGS) of SlPSY1 resulted in a yellow flesh phenotype, with complete disappearance of linear carotenoids and only trace amounts of other carotenoid compounds [15, 23]. On the other hand, silencing of SlPSY2 and SlPSY3 did not result in any obvious fruit phenotype, suggesting tomato PSY1 has a dominant role in the fruit. This is probably because tomato SlPSY2 functions mainly in chloroplast-containing tissues . Apples are well known for their metabolites such as flavonoids and vitamin C, which are beneficial health compounds. Fruit flavour and colour are major apple breeding objectives because of their importance in determining consumer preferences [25–29]. In general, volatile apocarotenoids such as β-ionone and geranylacetone contribute to flavour while the accumulation of coloured carotenoid compounds in the fruit, together with chlorophyll and anthocyanins are responsible for fruit colour [30–32]. In a typical red skinned apple fruit, such as ‘Royal Gala’, the anthocyanin and carotenoid concentrations increase at maturity, while the chlorophyll concentration decreases . We previously characterized the apple carotenoid pathway and found strong correlation between carotenoid accumulation in apple fruit and transcript levels of three genes, zeta-carotene isomerase (Z-ISO), carotenoid isomerase (CRTISO) and lycopene epsilon cyclase (LCYE) . However, given the indispensable role PSY genes play in the carotenoid pathway as the first committed step, we have now also characterised the apple PSYs by assessing any overlapping or specialized roles they might have in fruit, from enzymatic function, protein localization and transcript levels. We also examined the transcriptional activation of the PSY promoters by APETALA2 domain/ethylene response transcription factors (AP2/ERF). Apple PSY genes were identified in the phytozome database (http://phytozome.jgi.doe.gov). Multiple amino acid sequence alignments were performed with ClustalW  using default parameters and were manually adjusted in Geneious (www.geneious.com). Transit targeting peptides of full length PSYs were predicted using the ChloroP bioinformatic tool . Phylogenetic analysis was conducted using MEGA6 . Evolutionary relationships were inferred using the Neighbor-joining method, with 1000 Bootstrap re-sampling strategy. The database accession numbers of sequences used are: AtPSY (AAA32836), EjPSY1 (KF922363), EjPSY2A (KF922364), EjPSY3 (KF922367), MdPSY1 (KT189149 corresponds to MDP0000177623), MdPSY2 (KT189150 corresponds to MDP0000237124), MdPSY3 (KT189151 corresponds to MDP0000151924), MdPSY4 (KT189152 corresponds to MDP0000288336), MdSQS1 (AGS78117), MdSQS2 (AGS78118), MePSY1 (ACY42666), MePSY2 (ACY42670), MePSY3 (cassava4.1_033101m available at http://phytozome.jgi.doe.gov), OsPSY1 (AAS18307), OsPSY2 (AK073290), OsPSY3 (DQ356431), SbPSY1 (AY705389), SbPSY3 (AAW28997), SlPSY1 (ABM45873), SlPSY2 (ABU40771), SlPSY3 (Solyc01g005940), ZmPSY1 (Zea mays) AAX13806, ZmPSY2 (AAQ91837), ZmPSY3 (DQ356430). The pACCAR25ΔcrtB (ΔcrtB) plasmid has all the genes needed to produce zeaxanthin diglucoside, except for a gene encoding PSY . The pACCRTE plasmid, carrying the bacterial crtE gene to produce geranylgeranyl pyrophosphate (GGPP), was constructed by removing the crtY, crtI, crtB genes from pAC-BETA  by digesting with SalI followed by religation of the vector. The pAC-PHYT vector for producing phytoene in bacteria was used as a positive control . To test functional complementation, fruit cDNA fragments of MdPSY1, MdPSY2, MdPSY4, without predicted transit peptides, were amplified and cloned into the pET200/D TOPO vector (Life Technologies, Carlsbad, California, USA) to give pETPSY1ΔTP, pETPSY2ΔTP and pETPSY4ΔTP constructs respectively. Competent cells of DH5α, carrying either the ΔcrtB or pACCRTE, were co-transformed with the PSY constructs. Transformed cells were selected on LB plates with 34 mg/L chloramphenicol and 50 mg/L kanamycin at 37 °C overnight. Fifty mL of Luria-Bertani (LB) broth was inoculated with one mL of overnight bacterial culture, supplemented with antibiotics and grown at 37 °C for 8 h before induction with 10 mM IPTG. This was followed by incubation at 28 °C in the dark, with shaking at 200 rpm for 48 h and then an additional 48 h without shaking. Cultures were centrifuged for 15 min in the dark at 4000 x g, resuspended with five mL of methanol containing 1 % butylated hydroxytoluene (BHT) and sonicated twice with 30s pulses on ice, at 50 % of output power using a Microson Ultrasonic Cell Disruptor XL2005 (Heat Systems, Farmingdale, New York) equipped with a tapered 3 mm microtip. Samples were centrifuged at 4000 x g to pellet disrupted cells and the supernatant flushed to dryness with nitrogen. The dried extract was resuspended with acetone for high-performance liquid chromatography (HPLC) analysis. Full-length ‘Royal Gala’ apple fruit cDNAs were amplified by polymerase chain reaction (PCR) and cloned into a Gateway destination vector, pGWB441 [41, 42], in-frame with enhanced-yellow fluorescent protein under the Cauliflower Mosaic Virus 35S promoter. Transient expression of fluorescent fusion proteins in maize etiolated leaf protoplasts was visualized with a DMI6000B inverted confocal microscope with TCS SP5 system (Leica Microsystems CMS) as described previously . Images were obtained by combining several confocal Z-planes. A 50 mg dry weight (DW) sample of powdered freeze-dried material from each sample was moistened with water (approx 100 μl) and first extracted overnight in 2 mL of acetone:methanol (7:3) with 200 mg mL−1 CaCO3. Extracts were kept at room temperature and covered with foil to exclude light. The extract was centrifuged for 5 min at 21,000 x g, the supernatant removed and re-extracted with an additional 1 mL of acetone:methanol (7:3). This process was repeated 3 times. The combined supernatants for each sample were partitioned with equal volumes of diethyl ether and water, and the diethyl ether fraction removed. This process was repeated until the acetone aqueous phase was colourless. The combined diethyl ether fractions were dried under O2-free N2 and the carotenoids dissolved in 1 mL of 0.8 % BHT/acetone as previously described  and then analysed by HPLC. HPLC analysis was performed on a Dionex Ultimate 3000 solvent delivery system (Thermo Scientific, Sunnyvale, California) fitted with a YMC RP C30 column (5 μm, 250 x 4.6 mm), coupled to a 20 x 4.6 C30 guard column (YMC Inc. Wilmington, North Carolina) (column temperature 25 °C) and a Dionex 3000 PDA detector as previously published . Phytoene was monitored at 280 nm and phytofluene at 350 nm. Coloured carotenoids and chlorophyll b were detected at 450 nm, while chlorophyll a and other chlorophyll derivatives were monitored at 430 nm. Carotenoid concentrations were determined as β-carotene equivalents /g DW of tissue. Chlorophyll b was determined using a chlorophyll b standard curve derived from a spinach extract . Chlorophyll a and other chlorophyll derivatives were determined as chlorophyll a equivalents/g DW of tissue, again derived from a standard curve using the spinach extract and monitoring absorbance at 430 nm. β-carotene, and lutein were identified in the extracts by comparison of retention times and on-line spectral data with standards. All trans-β-carotene and lutein were purchased from Sigma Chemicals (St Louis, Missouri, U.S.A.). Other carotenoids were putatively identified by comparison with reported retention times and spectral data [46–50] and by comparison with carotenoids present in a spinach sample. Total carotenoid and chlorophyll content of the fruit tissue was also estimated using methods as previously described . Total RNA was extracted by tissue homogenisation in CTAB buffer using a modified method from one previously described [34, 52]. cDNA was synthesised from total RNA (0.5-1 μg) using Superscript III reverse transcriptase (Life Technologies, Carlsbad, California, USA) following the manufacturer’s protocol. Reaction components included 50 μM oligo dT (12) primer, 500 μM dNTPs, 1X reverse transcription buffer, 5 mM MgCl2, 10 mM DTT, 40 units of RNaseOUT and 200 units of reverse transcriptase. The reactions were incubated at 50 °C for 50 min. Primers were designed using PRIMER3 software  to a stringent set of criteria. RT-qPCR was performed under conditions described previously [34, 54] (Additional file 1). First strand cDNA products were diluted 1:25 and used as templates for the PCR reaction. PCR analysis was performed using the LightCycler 1.5 system and the SYBR Green master mix (Roche, Penzberg, Germany), following the manufacturer’s protocol. Each reaction sample was analysed from biological replicates, with a negative control using water as template. PCR conditions were as follows: pre-incubation at 95 °C for 5 min followed by 40 cycles each consisting of 10 s at 95 °C, 10 s at 60 °C and 20 s at 72 °C. Amplification was followed by a melting curve analysis with continuous fluorescence measurement during the 65–95 °C melt. The relative expression was calculated using LightCycler software version 4 and the expression of each gene was normalised to apple Actin and Elongation factor1-α gene, whose expression are considered stable in these tissues [34, 55]. MdPSY1 and MdPSY2 promoter fragments (1.5 kb) were amplified from ‘Royal Gala’ genomic DNA using primer pairs PSYprom1F (ATTCACTTTCAGGGAGGCGAAC) and PSY1prom1R (GGTTTTGGGTCTTGAGTGTGAG), and PSY2promF (CAGTATCGCGAATTTTTCGT) and PSY2promR (GAGGGTGTGAGTATGTGAGCTG) respectively. PCR fragments were cloned into pGEM-T Easy vector (Promega, Madison, USA) and then sub-cloned as Not I fragment into pGreen II 0800-LUC vector, upstream of the Luciferase reporter . 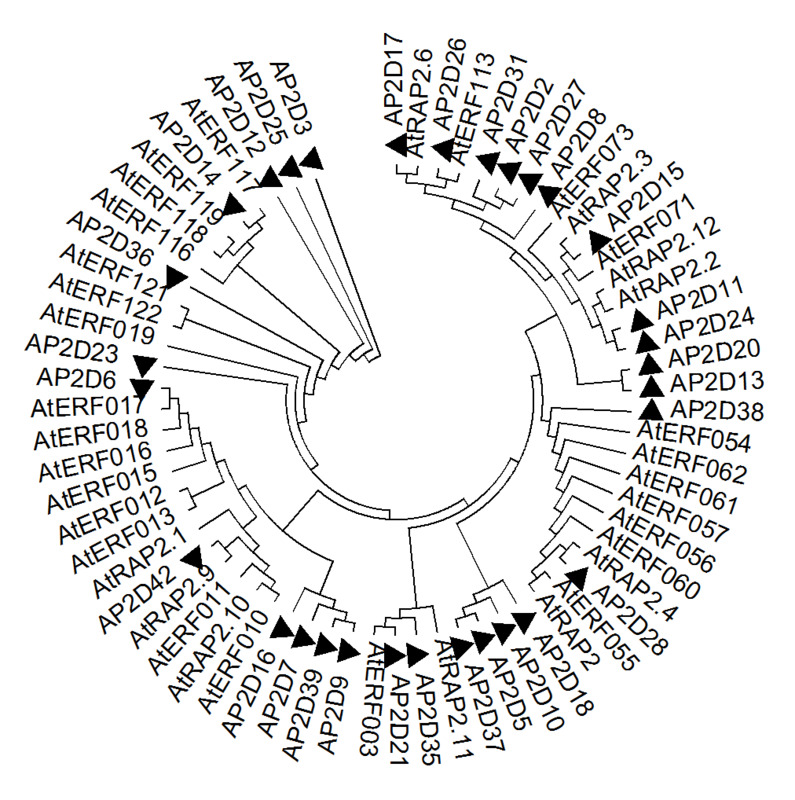 The apple AP2/ERF transcription factors were cloned as previously described [56, 57]. cDNAs from expressed sequenced apple libraries  were cloned into pART27 binary vector using restriction enzymes or pHEX2 using Gateway cloning. Transient assays were performed as previously described [56, 57]. Agrobacterium tumefaciens strain GV3101 carrying a cloned PSY promoter construct or AP2/ERF construct were both resuspended in infiltration buffer (10 mM MgCl2, 0.5 μM acetosyringone) and infiltrated into the abaxial side of Nicotiana benthamiana leaves. The plants were left to grow for 2 days before 2 mm leaf discs were taken from infiltrated leaves and assayed with Victor 3 Multi-label Microplate Reader (Perkin Elmer, Waltham, Massachusetts, USA). Luciferase expression under PSY promoters relative to Renilla luciferase signals under the Cauliflower Mosaic Virus 35S promoter was measured. Twelve apple PSY gene models were identified in the Phytozome sequence database (Additional file 1). Sequence analysis showed these gene models map to six positions on four chromosomes (3, 9, 11 and 17), suggesting six PSY genes are present in the apple genome . We amplified four of these genes (MdPSY1-4) in fruit for analysis, while two of them, "MdPSY5" and "MdPSY6", which are present as additional genes on chromosomes 9 and 11 respectively, did not have transcripts available in the publicly available apple EST libraries  so were not further analysed. In order to understand the roles of the multiple apple PSYs in carotenogenesis, we analysed their gene sequences. Comparisons of PCR amplified ‘Royal Gala’ cDNA, and genomic DNA fragments of these genes revealed a strong nucleotide and amino acid sequence similarity between MdPSY1 on chromosome 17 and MdPSY2 on chromosome 9, and between MdPSY3 (on chromosome 3) and MdPSY4 (on chromosome 11). MdPSY1 has a predicted 400-amino acid protein while MdPSY2 has a predicted protein of 401 amino acids. MdPSY3 has a stop codon after residue 130, from the original ORF start site, resulting in a truncated protein. There is a potential methionine start site at residue 150, which could result in a 242-amino acid protein. However, it is possible this MdPSY3 transcript, sequenced from four fruit cDNA clones, is a result of mis-splicing; when the MdPSY3 transcript is compared with the MdPSY3 and MdPSY4 genomic DNA sequences, the stop codon appears to be the result of a 15 bp footprint sequence left on exon 3 during the splicing of intron 2. Thus, there could be other correctly spliced MdPSY3 transcripts present in apple without the internal stop codon. Such correctly spliced transcripts would result in a protein sequence identical to MdPSY4, which has an ORF of 1158 bp, encoding a predicted 386-amino acid protein. Multiple sequence comparisons of the predicted proteins indicated that MdPSY1 has 94 % identity to MdPSY2, while MdPSY3 has 98 % identity to PSY4 (Figure 1). In contrast both MdPSY1 and MdPSY2 have 54 % identity to MdPSY4. Comparing genomic and cDNA sequences revealed different exon-intron boundaries for the four PSY genes (Additional file 2). MdPSY1 and MdPSY2 have five exons and four introns, similar to the reported gene structure of the closely related loquat EjPSY2A . MdPSY1 and MdPSY2 have similar exon sizes but differently spliced introns. MdPSY4 has 6 exons and five introns, which is similar to MdPSY3 (both in size and position). Compared with the MdPSY4 protein sequence, the stop codon in MdPSY3 appears to be the result of a 15 bp footprint sequence left on exon 3 during the splicing of intron 2. Phylogenetic analysis of predicted amino acid sequences (including transit peptides) classified PSY1, PSY2, PSY3 and PSY4 into two distinct clades, supporting the observation that these pairs arose from a single duplication event (Fig. 2). Apple MdPSY1 and MdPSY2 form a clade with maize ZmPSY2, rice OsPSY2 and loquat EjPSY2A. On the other hand, MdPSY3 and MdPSY4 grouped together with loquat EjPSY3, cassava MePSY3, and tomato SlPSY3. To test whether the apple PSY genes encode functional enzymes, we used a standard bacterial complementation method for assessing carotenoid pathway enzyme function [10, 61]. Escherichia coli test strains were produced by transforming them with either pACCRTE, which encodes the enzyme to produce GGPP in bacteria, or pACCAR25ΔcrtB (ΔcrtB) which requires PSY function to produce zeaxanthin and its glycosylated derivatives . Next, vectors with cDNA fragments encoding the open reading frame of the apple PSYs with predicted transit peptides removed, were transformed into each of the test strains. MdPSY1 and MdPSY2 constructs in cells with pACCRTE produced phytoene, with a peak whose retention time and spectral qualities were similar to the positive control (Fig. 3a). Similarly, ΔcrtB cells produced zeaxanthin diglucoside when transformed with MdPSY1 and MdPSY2 constructs (Fig. 3b). The extracts from these transformants had distinct yellow colouration and the peak retention times and fine spectral qualities were consistent with HPLC standards and previous publications (Fig. 3b) [22, 38]. Surprisingly, MdPSY4 in bacterial cells with pACCRTE or ΔcrtB did not result in the expected product peaks (Fig. 3). The same result was obtained with extended induction periods or using the full-length MdPSY4 including its transit peptide, suggesting MdPSY4 is not able to catalyse the conversion of GGPP to phytoene in bacteria. To ascertain the targeting of the apple PSYs, we fused PCR amplified fragments encoding apple PSYs including their predicted transit peptides to the enhanced yellow fluorescent protein (eYFP) [41, 42]. The fusion constructs were transiently expressed in maize etiolated leaf protoplasts and analysed using fluorescent confocal microscopy. Both MdPSY1 and MdPSY2 were co-localised with chlorophyll in the chloroplast confirming they are translocated to plastids (Fig. 4). MdPSY3 has a premature stop codon and was not further tested. MdPSY4 was localized to speckles associated with the chloroplasts (Fig. 4); these speckles are shown to be plastoglobuli using the maize plastoglobulin-2 as marker . To understand the role of PSYs in carotenogenesis during fruit development, we selected two commercial apple cultivars 'Granny Smith' and 'Royal Gala' based on the pigmentation of their fruit skin and flesh. ‘Granny Smith’ has a green skin and white flesh while 'Royal Gala’ has a red coloured skin with creamy flesh (Fig. 5a). Carotenoid and chlorophyll pigments were measured at different stages of fruit development. Total carotenoid concentration in ‘Granny Smith’ fruit skin was 2–5 fold greater than in ‘Royal Gala’ (Fig. 5b). In both cultivars, total carotenoid concentration in fruit skin appeared unchanged between 30 and 90 days after full bloom (DAFB) (~150 μg/g dry weight in ‘Granny Smith’ compared with ~75 μg/g dry weight for ‘Royal Gala’), followed by a significant decrease at 120 and 150 DAFB. Lutein and beta-carotene were the dominant compounds present in the analysed tissues and both compounds were up to 3-fold higher in ‘Granny Smith’ than ‘Royal Gala’ tissues (Additional file 3). The total carotenoid concentration in fruit flesh was about 7–10 fold lower than in skin and there was no clear pattern observed between the two cultivars. Total chlorophyll concentration (which includes breakdown compounds pheophytin a and b) in ‘Granny Smith’ tissues was 2–5 fold higher than in ‘Royal Gala’ (Additional file 3). A strong correlation was observed between total chlorophyll and carotenoid concentration (r = 0.97, p < 0.01) in these tissues, which suggested that most of the carotenoids present were associated with chloroplastic structures. We analysed the transcript levels of MdPSY1 and MdPSY2 in fruit skin and flesh tissues of the two cultivars. Both MdPSY1 and MdPSY2 were, in general, higher (1.1 to 12 fold) in fruit skin than in flesh, consistent with higher carotenoid concentrations (2–5 fold) in fruit skin compared to the flesh . Both MdPSY1 and MdPSY2 had similar tissue transcript profiles in both cultivars, though the transcript level of MdPSY2 was higher than that of PSY1 (Fig. 6). The transcript levels were reduced in young fruit skin and the highest transcript level was observed at 60 days after full bloom (DAFB). After this stage, transcripts decreased, with the exception of that in the ‘Royal Gala’ 150 DAFB tissue. In the flesh, MdPSY1 and MdPSY2 transcript levels were similarly reduced at the early fruit stages (30 and 50 DAFB) and increased at 60 DAFB. After this stage, MdPSY1 transcripts reduced while MdPSY2 transcript levels increased in ‘Royal Gala’ flesh until 150 DAFB. MdPSY transcript levels were next examined in various apple tissues (Fig. 7). MdPSY1 and MdPSY2 were present in varying levels in all tissues examined, including both photosynthetic and non-photosynthetic. In small and expanded leaves as well as in open and unopened flowers, MdPSY2 transcripts were at higher levels (3- to 5-fold) as compared to PSY1. Transcript levels for the two PSYs were similar in shoot tissues while in tissue-cultured roots, MdPSY2 levels were about 9-fold higher than for MdPSY1. Taken together, MdPSY2 represented the PSY gene with the most abundant transcripts. However, the PSY transcripts did not correlate with the total carotenoid levels in these tissues. The transcript levels of MdPSY2 compared with MdPSY1 suggested these two paralogs are differentially regulated. To determine whether this differential regulation is related to diversity in the gene promoters, we amplified and sequenced 1.5 kb promoter fragments of MdPSY1 and MdPSY2 from ‘Royal Gala’ and found <30 % nucleotide similarity between these two gene promoters. Motif analysis by MatInspector  identified RAP2.2 (an APETALA2/ethylene response factor-type transcription factor) binding motifs in the PSY promoter sequences. Three RAP2.2 motifs were present in the PSY1 promoter, all within 500 bp upstream of the ORF, while only two motifs were found in the PSY2 promoter (Fig. 8a). In order to test functionality of the RAP2.2 binding motifs, both promoters were tested for transactivation with 36 apple AP2/ERFs transcription factors (TFs)  (Additional file 4, Additional file 6) using Agroinfiltration into young leaves of Nicotiana benthamiana [56, 63, 64]. Agrobacterium strains were separately transformed with constructs carrying PSY promoters cloned upstream of a Luciferase reporter or a gene encoding a AP2/ERF TF, which were together co-infiltrated into .Nicotiana benthamiana leaves. Transactivation was measured as an increase in luciferase levels compared to controls lacking a co-infiltrated transcription factor, normalised to 35S-Renilla . The results showed differential trans-activation of the PSY promoters. For instance, the MdPSY2 promoter was trans-activated (~15-fold increase) by AP2D21, a homolog of AtERF3, compared to a ~5-fold increase of MdPSY1 promoter activity. Both PSY promoters were strongly activated by AP2D15 and AP2D26 homologs of AtRAP2.3 (47 % identity) and AtERF113 (49 % identity) respectively (Fig. 8b). Physiologically relevant transactivation is predicated on overlapping in vivo expression of a candidate TF and the PSY target. Therefore, we analysed transcript levels of AP2D15 and AP2D26, in the skin and flesh tissues of the apple cultivars (Additional file 5). Both AP2D15 and AP2D26 transcript levels increased from early fruit stage (30 DAFB) through to ripe fruit stage (150 DAFB) in both apple cultivars. Co-expression measured as correlation between gene expression of transcription factors and PSYs showed strong positive correlation between AP2D26 and PSY2 in fruit skin (Table 1), further suggesting a potential regulatory relationship. Apples are consumed globally and are chosen to eat for their healthful metabolites and convenience. Consumers associate presence of nutritionally favourable compounds with fruit colour, partly contributed by carotenoids. Thus, carotenoid content has become an important apple breeding objective [25, 31, 34]. The phytoene synthase step is known to play a significant role in the carotenoid pathway because of its position as the first committed step, potentially controlling the flux downstream [65, 66]. Many plant species are known to have multiple PSY genes, including apple [34, 60]. The multiple PSY genes highlight the issue of functional diversity because of the potential to acquire a novel function, subfunctionalize or even lose the original function [67, 68]. The domesticated apple has 17 chromosomes, which may have been a result of both recent and older whole genome duplication (WGD) events . The six apple PSYs are present on four chromosomes, which suggests that prior to the most recent genome duplication, at least two ancestral apple PSY genes on different chromosomes were present, resulting in the two homeologous pairs PSY1/PSY2 and PSY3/PSY4 described here. MdPSY3/PSY4 cluster with maize and rice PSY3, which have had their function proven in bacteria. Others, such as cassava MePSY3, tomato SlPSY3and loquat EjPSY3, which also share high homology to the apple PSY4 (66 %, 72 % and 96 % identity respectively) have not been tested or have been found to be non-functional [15, 21, 22, 60]. The non-functionality of MdPSY4 in bacteria could be because of the acquisition of a new function or perhaps mutation of some active sites. However, sequence analysis showed it was closer to PSY sequences than squalene synthase [18, 69]. It must be noted however, that while heterologous expression of plant genes in bacteria is a widely used method, the plastid environment where these enzymes function is absent, which may affect catalytic activity due to improper membrane localization of the enzyme and/or protein complex formation . The localization of apple MdPSY4 to the plastoglobuli, in contrast to MdPSY1 and MdPSY2 in the chloroplast, may be important here in the sense that the catalytic activity of MdPSY4 could be influenced by its protein location. The tomato SlPSY3, for instance, was recently shown through virus induced gene silencing to affect carotenoid accumulation . It remains to be seen if MdPSY4 has acquired a different function or its catalytic activity is affected by protein complex formation. We examined MdPSY1 and MdPSY2 transcript levels because of the ability of the encoded proteins to catalyze the conversion of GGPP to phytoene. Between these two genes, there was no tissue specific expression among the wide ranging apple tissues we examined to suggest subfunctionalization. Subfunctionalization of duplicated genes can take the form of complementary gene expression patterns in different tissues or partitioning protein function between paralogs [70, 71]. The absence of gene expression partitioning among the apple PSYs contrasts with what is observed in plants, such as maize, where subfunctionalization is observed among the PSYs . This lack of difference in tissue-specific expression between MdPSY1 and MdPSY2 could be because the gene duplication between them is a recent event. One obvious difference between MdPSY1 and MdPSY2 was their unequal gene expression levels. Unequal gene expression between paralogs in duplicated genomes can be an immediate consequence of the polyploidization or a result of changes introduced over time [72, 73]. The variation in gene expression between these PSY paralogs could be related to gene dosage effects or may simply be immaterial . However, the higher relative expression of MdPSY2 over MdPSY1 is consistent with previous study where MdPSY2 showed higher transcript levels (3–5 fold) over MdPSY1 in different apple cultivars . This could mean MdPSY2 has a dominant role in apple and may be primarily responsible for this first carotenoid pathway step in apple tissues. However, both PSY transcripts do not correlate with total carotenoid levels, suggesting post-transcriptional processes may be important for determining flux through this enzymatic step. Recent knowledge on regulation of PSY in controlling carotenoid biosynthesis has shown that post-transcriptional mechanisms play a major role in the pathway . With adequate expression of the PSY transcript, which we have shown is mainly PSY1 and PSY2 in apple fruit, it is then the stability of the protein which defines PSY as the rate limiting step in carotenogenesis . In Arabidopsis this stability is modulated by the chaperone protein, AtOR . Such knowledge has implications for apple breeding, where marker assisted selection is accelerating the breeding of better cultivars . The possibility of different transcriptional mechanisms controlling the different expression of apple MdPSY1 and MdPSY2 is supported by the significant sequence differences in their promoters as well as the varied responses to transient activation by the AP2/ERF transcription factors we tested. The AP2/ERFs are implicated in many plant development processes such as floral development and response to biotic and abiotic stress [77, 78]. Their role in the carotenoid pathway was highlighted in Arabidopsis, when AtRAP2.2 was implicated in binding of the PSY promoter . The apple AP2/ERF family has been characterised with some members implicated in fruit development [57, 58]. The expression pattern of AP2D15 and AP2D26, with increased transcript levels as the fruit matured, suggests these genes have a role in fruit development. This, in addition to the transient activation of PSY promoters and the high correlation observed between their gene expression and PSYs point to a potential relationship where these AP2/ERFs are possibly regulating the PSYs. There is circumstantial evidence supporting AP2/ERFs in carotenogenesis in tomato, where they have been shown to regulate the carotenoid pathway negatively during fruit ripening. SlAP2a indirectly affects the carotenoid pathway through regulation of the ethylene pathway, as RNAi repression of this gene resulted in a concomitant increase in both ethylene and carotenoid compounds in fruit. Similarly, SlERF6 was shown to affect carotenoid accumulation, where reduced expression by RNAi knockout resulted in increased carotenoid concentration in fruit. While these examples suggest both wild type genes are negative regulators of the pathway [80,81], they do not show any direct regulation of the carotenoid biosynthetic genes by the AP2/ERFs. The PSY step in carotenogenesis is under complex transcriptional and posttranscriptional regulation. The tomato SlPSY1 and SlPSY2 are targets of the MADS-box transcription factor Ripening Inhibitor, and SlPSY1 gene expression and enzyme activity is inhibited by tomato Stay-green 1 [82, 83]. AtPSY is regulated by AtPIF1 through direct binding to the promoter to repress transcription and more recently, the Arabidopsis Orange (OR) and OR-like proteins are showed to be major posttranscriptional regulators of AtPSY, controlling AtPSY protein levels and carotenoid content [75, 84]. The further analysis of apple AP2/ERFs interactions with apple PSY promoters will increase our understanding of their role in the carotenoid pathway and maybe reveal how the apple PSYs are transcriptionally controlled. The data presented here suggest that the first committed carotenoid pathway step in apple is encoded by two functional genes MdPSY1 and MdPSY2, with other apple PSYs playing little or no role in this respect. This has implications for apple breeding programmes that have fruit colour as a breeding target. Characterisation of the PSY gene family members increases our understanding of how the first carotenoid pathway step is controlled in apple and for instance, would allow co-segregation with fruit colour phenotypes to be tested during the development of new cultivars. This work was supported by Plant & Food Research Core programme for Consumer Traits in pipfruit. The Wurtzel laboratory was supported through funding from the National Institutes of Health (grant GM081160). We are grateful to Tim Holmes for photography and illustrations, Steve Arathoon for HPLC measurements, Bradley Drayton who spent a summer studentship at PFR studying the apple PSYs, Robert Schaffer and Ross Atkinson for helpful comments. We are grateful to Andrew Gleave and the Genomic Technologies team, Karen Grafton and Karen Bolitho for EST retrieval and cloning of AP2/ERFs into Agrobacterium vectors. Thanks to Anne Gunson and the Science Publication Office (PFR) for editing the manuscript. CAD, RVE and ACA conceived the experimental design. CAD and ND provided analyses of the bioinformatic, transcriptomic and transactivation data. DL performed the HPLC analysis of fruit carotenoid content. MS and ETW provided analysis of protein localization. XC collected fruit samples and assisted in RNA extraction. CAD wrote the body of the paper; all authors reviewed and edited the manuscript.